When the Fibularis Longus is weak, what kinds of performance and health issues can you get? Let’s look at Fibularis Longus (FL) anatomy, actions, measurement methods along with the implications weak FL strength can have on your athletic performance and health. Note: The Fibularis Longus is also known as the Peroneus Longus muscle. The fibularis longus terminology has an advantage when learning anatomy in that it indicates the muscle is on the fibula side of the lower leg. Anatomy – The FL is located on the lateral side (outer side or side with the fibula) of the lower leg and is superficial (towards the skin). The top of the muscle attaches to the upper 2/3 of the fibula and the deep connective tissue between the tibia & fibula. 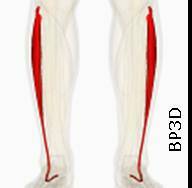 The muscle runs down the lateral side of the calf, connects to its’ long round tendon which runs behind the lateral ankle. From there, the tendon crosses to the opposite side of the bottom of the foot. The path of the tendon is on the plantar (bottom) side of the foot traveling on a diagonal from behind the lateral ankle towards the peak of the long arch. There it attaches to the base of the 1st metatarsal and 1st cuneiform bones. Action – The main action of this muscle is to plantar flex (point) your foot and at the same time, evert it (twist towards the outside). This can be summarized as, “pointing your foot down and out”. Diagnosis – Weakness in the FL can be determined with manual muscle strength testing, careful observation of ankle alignment during walking, running and at rest and other tests. Supporting information can be gained through a detailed history as well as physical examination for neurological, vascular and orthopedic signs. Measurement of FL ranges of motion and muscle strength are available with specialized equipment when required for more detailed examinations, insurance purposes or research. Functional Implications – When the FL muscle is weak, you will not have the strength you should in the following situations. 1) lateral ankle stability, 2) lateral movements of the body to the opposite side, 3) lateral movements of the foot to the same side. With a weak FL, all of the following activities will not be as effective as they could be. 1) Lateral Ankle stability – Because of the shape of the bones in the ankle regions, the ankle is most unstable when the foot is plantar flexed. This means that you cannot rely as much on bone or ligament strength to maintain stability. The FL along with it’s smaller neighbor Fibularis Brevis are the only muscles that support the lateral ankle when the foot is in plantar flexion. Having adequate strength in the FL is thus critical in any activity that requires maintaining ankle stability. For example, running over rough terrain, sticking a landing in gymnastics or ‘holding an edge’ when snow skiing. This will also be a critical factors for seniors who have balance issues and are looking to prevent traumatic falls. 2) Lateral movement of the body to the opposite side – Any sport that includes movement of the body laterally will have degraded performance with a weak FL. Let’s clarify which type of lateral movement will be impaired with this example – the right FL will assist in moving your body to the left side. The FL does not function in a purely lateral motion. It simultaneously includes plantar flexion. This compound motion can be used for both acceleration and deceleration movements that include a diagonal component to the opposite side. Acceleration Forward – When in the ‘toe off’ gait phase with your right leg behind your body, the right FL will assist in accelerating you forward on the diagonal to the left. Acceleration Backward – From a normal standing position, the right FL will assist with accelerating your body backwards and towards the left. An example of this motion would be a basketball player jumping backward and to the left side for a lateral fadeaway shot at the basket. Deceleration Forward – When moving forward and your right leg is coming into ‘heel strike’, the FL will assist you in deceleration or putting on the breaks with some additional movement towards the left side. For example – this would happen in a situation where a football runner decelerates quickly and moves to the left to evade a tackler. Deceleration Backwards – If you are moving backward and your right leg is coming into ‘toe strike’ behind you, the FL will assist you in decelerating while also giving you some lateral movement to the left. An example of this would be a hockey player skating backward and trying to slow down while also changing the angle of backward movement more to the left side. 3) Lateral movement of the foot to the same side – Sports that use the FL for this function include soccer players kicking a ball with their outside forefoot. Injury Susceptibility – In addition to performance degradation, athletes with weak FL muscles, will be susceptible to increased rates of injury due to ankle instability. As mentioned earlier, the ankle is particularly unstable when in plantar flexion (the foot is pointed down). In addition, the ligaments on the lateral ankle are much weaker than on the medial side. This combination of factors makes lateral ankle sprains when the foot is pointed, the most common form of ankle sprain. An example of the classic ankle sprain is the runner who is landing on their foot and there is a rock under the medial side. The foot will be pointed and unstable and it will roll to the outside. If the FL is not strong enough, the sudden weight put on the FL will cause a strain (tearing some muscle fibers). As the joint continues to roll laterally, unprotected by an adequate FL, weight will eventually be thrust on the relatively weak lateral ankle ligaments resulting in a partial or complete sprain (ligament tear). Chronic Weakness – With a classic lateral ankle sprain, both the FL and the lateral ankle ligaments are damaged. Rather frequently, therapy is only oriented to recovery of the ligament. The joint is immobilized or supported with athletic tape, rigid or semi-rigid device until the ligaments can take weight bearing without difficulty. Rehabilitating the FL with specific exercises to increase strength of the damaged tissue is frequently necessary to prevent a chronic weakness of the FL and increased susceptibility to recurring ankle sprains, instability and performance degradation. Previous Previous post: What can cause muscle strength imbalances? Next Next post: Why not a fall getaway learning weekend? Great location to learn and enjoy the harvest!